Changes in chromatin structure are expected to affect radiosensitivity., Transcriptionally active genomic regions, comprising an acetylated and relaxed chromatin structure, have proved to be more sensitive to ionizing radiation.,,,,, On the other hand, cells are also more radiosensitive when the chromatin achieves a high state of compaction during the G2/M phase of the cell cycle although G2/M cells do not get more DNA double-strand breaks (DSBs). Therefore, even though a more relaxed chromatin structure favors the production of radiation-induced DNA strand breaks, DNA repair could be an important component of radiosensitivity as well. Precise dose estimation, by means of a chromosomal aberration scoring, is necessary to determine health risk assessment when people are exposed to ionizing radiation. Dicentric chromosomes as well as translocations are the most widely used biomarkers in biological dosimetry for dose estimation. In addition, radiosensitization induced by HDACi is accompanied by a prolonged nuclear appearance of γH2AX and 53BP1 foci as identified by immunofluorescent staining., To know if VA is suitable to sensitize human lymphocytes exposed to γ-radiation in vitro toward a possible application in biological dosimetry, two different doses of VA, commonly employed in clinics as reference levels in blood, were added to blood cultures after γ-irradiation, and all types of chromosomal aberrations (stable and unstable) were analyzed on metaphases following of fluorescent in situ hybridization (FISH). Blood samples were obtained from four nonsmoker healthy donors (neither received any pharmacological treatment), between 20 and 50 years old, who gave their informed consent. Whole blood samples (0.5 ml per culture) were cultured at 37°C during 24 h in 5 ml of RPMI 1640 (supplemented with 2 mM L-glutamine, 1 mM pyruvate, 10 mM HEPES buffer, and 1% penicillin-streptomycin) (Life Technologies, Cergy-Pontoise, France), with the addition of 20% fetal calf serum (FCS; Life Technologies, Cergy-Pontoise, France) and 5% phytohemagglutinin-M (PHA, M form, Life Technologies) to stimulate cells division. To analyze percentages of second metaphases, 1% BrdU was added to the cultures. Whole blood samples were irradiated with a source of γ-rays of Cesium 137 at 37°C, at 1.5 Gy (0.5 Gy/min) in an IBL Irradiator (137 Cs, γ-rays; IRSN, Fontenay-Aux-Roses, France), at a distance to the source of 550 mm. After γ-irradiation, cultures were incubated in the presence of VA (0.35 mM or 0.7 mM) at 37°C for the next 48 h until harvesting. Control cultures were processed similarly but without γ-rays and/or VA treatments. Blood cultures were treated with colcemid (0.1 µg/ml) (Colcemid KaryoMAX; Sigma-Aldrich, France) 2 h before harvesting. After harvesting, they were exposed to a hypotonic solution of KCl (0.075 M) for 10 min at 37°C, prefixed, and then fixed three times with methanol-acetic acid (3:1). For slide preparation, 30 µl of the cell suspensions were dropped onto clean slides in a Thermotron with controlled temperature (20°C) and humidity (43%). Slides were exposed to a Hoechst 33258 (0.05 mg/ml) solution for 10 min. Afterward, they were rinsed in distilled water, covered with 2 × SSC, and exposed to a 20 W ultraviolet lamp (>310 mm) for 60 min. Subsequently, the slides were washed in 2 × SSC, and then with distilled water. Finally, they were stained in a 4% Giemsa solution (in 2 × SSC) for 10 min, rinsed in distilled water, air-dreaded, and mounted. Giemsa staining images were captured with the Metafer4 software (MetaSystems, Germany) on a Zeiss Axioplan microscope, and mitotic index and percentages of second metaphases were estimated for each experimental condition. FISH technique was performed according to Pinkel et al., with some modifications as follows. Freshly chromosome spreads were pretreated with pepsin-HCl (0.05%) for 2 min a 37°C and immediately washed in Phosphate Buffer Solution (PBS) (1×) (PBS; Invitrogen, France) for 3 min. Subsequently, they were fixed in formaldehyde (20910.294; VWR, France) and MgCl2 solution (M2670; Sigma-Aldrich, St Quentin Fallavier, France) dissolved in PBS (1×) during 10 min at room temperature and washed in PBS (1×) for 3 min. Subsequently, the slides were dehydrated in 70%, 90%, and 100% ethanol (2 min each) and air-dried. Commercial whole chromosomes probes for chromosomes 2 (Rhodamine), 4 (Fluorescein IsoThioCyanate (FITC), and 12 (both Rhodamine and FITC) (Qbiogen probes, Illkirch, France) were denatured for 5 min at 75°C and then 30 min at 37°C. Slides' preparations were denatured 3 min at 37°C and immediately hybridized with the denatured chromosome probes (overnight, at 37°C). The following day, they were washed with 1 × SSC (SSC; VWR, Fontenay-sous-Bois, France) (2 min, 75°C) and rinsed in 2 × SSC plus 0.01% Tween 20 (28829.183; VWR, Fontenay-sous-Bois, France) (1 min, at room temperature). Finally, they were washed in PBS (1×) for 3 min, counterstained with Vectashield plus DAPI (4, 6-diamidino-2-phenylindole-2-hydrochloride, Qbiogen, Illkirch, France), and mounted with coverslips. Fluorescent images were captured with Metafer system (MetaSystems GmbH, Germany) on a Zeiss Axioplan epifluorescence microscope, and the frequency of translocations was analyzed. For both dicentric and translocations scoring, a minimum of 1000 metaphases from the first cell division containing the complete set of chromosome (2n = 46) were analyzed. Dicentric and translocations were observed in FISH-three color chromosomes 2, 4, and 12 painting according to Pouzoulet et al. and extrapolated to the whole genome following Lucas et al. formula. It was considered that chromosomes 2, 4, and 12 represent the 34% of the total genome, covering 19% of the DNA content according to Morton  and regarding the exchanges between painted and unpainted chromosomes. The genomic frequencies, FG, were calculated from the respective frequencies (Fp) of painted chromosomes, applying the standard formula: FG = Fp/2.05 fp (1 − Fp), where Fp is the aberration frequency detected by painting and fp is the fraction of the genome painted, i.e., target chromosomes 2, 4, and 12. One-way ANOVA test (with a confidence interval of 95%) was employed to compare the genome equivalent (GE) yields of chromosomal aberrations obtained under different experimental conditions: Control cultures; 1.5 Gy γ-irradiated, VA (0.35 or 0.7 mM) treated blood cultures, and 1.5 Gy γ-irradiated plus VA (0.35 or 0.7 mM) treated cultured human lymphocytes. VA was also proposed as a radiosensitizing agent. Different mechanisms have been associated with radiosensitization following HDAC inhibition, namely: (a) Changes in chromatin structure that increase the accessibility of reactive oxygen species mediating the 60% of radiation-induced DNA damage or can induce transcriptional modifications of genes involved in DNA damage response; (b) changes in chromatin remodeling processes preceding DNA repair that can independently influence repair of radiation-induced DNA injury;,, (c) incomplete chromatin restoration at the final step of the DNA repair process; or (d) direct inhibition of radiation-induced DNA damage repair proteins. To know if the addition of VA after the irradiation of blood samples is able to sensitize human lymphocytes for the formation of different types of chromosomal aberrations, blood samples from four healthy donors were exposed to γ-rays, and subsequently subjected to two different doses of VA. These doses of VA (0.35 and 0.70 mM) correspond to the blood reference levels commonly employed in clinics to reach the VA therapeutic efficacy on patients with epilepsy. In this respect, we have demonstrated that treatment of human lymphocytes with VA alone did not produce any increase in the genomic frequency of chromosomal aberrations [Figure 1]. Unstable chromosomal aberrations (UCA: Dicentrics, rings, and fragments) and stable chromosomal aberrations (SCA: Reciprocal and nonreciprocal translocations), analyzed by means of FISH on three painted chromosomes (HSA 2, 4, and 12), were scored on metaphases obtained after irradiation of human lymphocytes with 1.5 Gy of γ-rays in the presence or absence of VA (0.35 or 0.70 mM) added after irradiation and kept for 48 h in blood cultures. Pooled data from donors showed that human lymphocytes exposed to 1.5 Gy of γ-rays plus 0.35 mM VA did not vary significantly from the irradiated cultures alone in terms of the GE frequencies of total chromosomal aberrations [Figure 1]a. 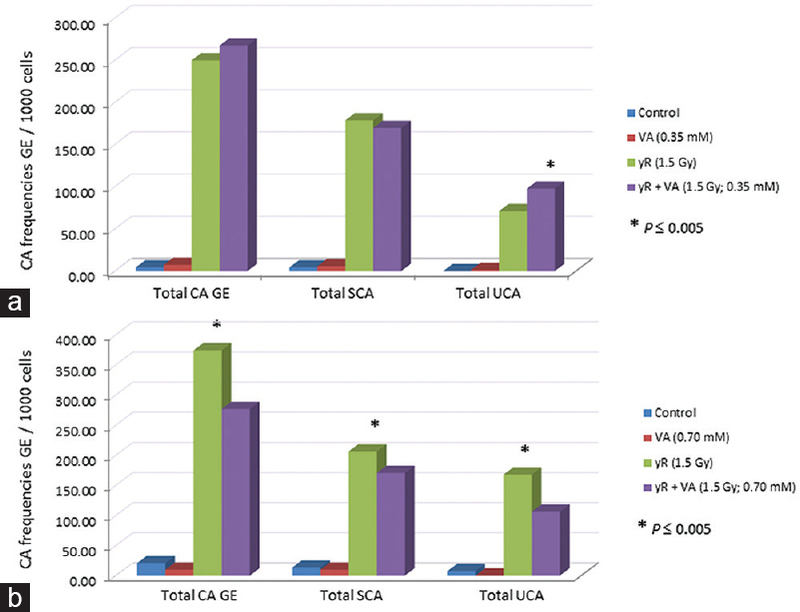 However, analyzing separately the frequency of UCA and SCA, there was a significant increase of UCA GE frequency when 0.35 mM VA was present (P ≤ 0.05). On the other hand, the frequency of all chromosomal aberrations induced by 1.5 Gy of γ-rays decreased significantly (P ≤ 0.05) when 0.70 mM VA was employed [Figure 1]b. This decrease was due to the significant decrease of both types of chromosomal aberrations, UCA and SCA (P ≤ 0.05). Contrary to expectations, the higher dose of VA did not sensitize human lymphocytes to γ-irradiation. On the other hand, the lower dose (0.35 mM) of VA only showed an increase of UCA GE frequencies after γ-irradiation, probably related to the effect of VA on the differential efficiency of signaling and/or DSB repair proteins involved in processing such chromosomal aberrations. Besides, the analysis of the mitotic index showed that human lymphocytes treated with γ-rays in combination with VA, highly decrease cell division, particularly with the posttreatment of 0.7 mM VA [Table 1]. On the other hand, the analysis of the percentage of second metaphases confirmed the cell cycle arrest produced by the presence of VA after γ-irradiation [Table 1]. It is known that HDACi induces a cell cycle arrest and apoptosis either in tumor cell lines , or in normal cells such as human lymphocytes,, which could explain why less damaged cells were observed after the higher VA dose [Figure 1]b.
Alternatively, several studies that examined the genotoxicity of VA by analyzing sister chromatid exchanges (SCEs) in human lymphocytes from patients treated with VA have shown opposite results. Hu et al. observed a significant increase of SCEs in human lymphocytes from epileptic children treated with VA, whereas Schaumann et al. found that VA treatment did not induce SCEs in peripheral lymphocytes of adult male patients. In this respect, results obtained showed a moderate degree of sensitization in terms of chromosomal aberrations when 0.35 mM VA was employed, while a higher dose of VA (0.70 mM) clearly did not increase the frequencies of chromosomal aberrations. VA could produce different effects depending on the dose, such as the cell cycle block at G1 stage, which could contribute in diminishing the frequencies of chromosomal aberrations. In this respect, it has to be taken into consideration that cell cycle arrest and lower amount of damaged metaphases were when VA is being employed as a sensitizer in combination with physical or chemical agents. The present work was supported by a CRP-IAEA project (ID1833). We are indebted to the National Regulatory Authority for RadioProtection of Uruguay (ARNR). Wolffe A. Chromatin Structure and Function. 3rd ed. San Diego: Academic Press; 1998. Hübner MR, Spector DL. Chromatin dynamics. Annu Rev Biophys 2010;39:471-89. Lafon-Hughes L, Di Tomaso MV, Méndez-Acuña L, Martínez-López W. Chromatin-remodelling mechanisms in cancer. Mutat Res Rev 2008;658:191-214. Méndez-Acuña L, Di Tomaso MV, Palitti F, Martínez-López W. Histone post-translational modifications in DNA damage response. Cytogenet Genome Res 2010;128:28-36. Bannister AJ, Kouzarides T. Regulation of chromatin by histone modifications. Cell Res 2011;21:381-95. Schreiber V, Dantzer F, Ame JC, de Murcia G. Poly (ADP-ribose): Novel functions for an old molecule. Nat Rev Mol Cell Biol 2006;7:517-28. Nathan D, Ingvarsdottir K, Sterner DE, Bylebyl GR, Dokmanovic M, Dorsey JA, et al. Histone sumoylation is a negative regulator in Saccharomyces cerevisiae and shows dynamic interplay with positive-acting histone modifications. Genes Dev 2006;20:966-76. Kothapalli N, Camporeale G, Kueh A, Chew YC, Oommen AM, Griffin JB, et al. Biological functions of biotinylated histones. J Nutr Biochem 2005;16:446-8. Jeppesen P. Histone acetylation: A possible mechanism for the inheritance of cell memory at mitosis. Bioessays 1997;19:67-74. Mei S, Ho AD, Mahlknecht U. Role of histone deacetylase inhibitors in the treatment of cancer (Review). Int J Oncol 2004;25:1509-19. Pinder RM, Brogden RN, Speight TM, Avery GS. Sodium valproate: A review of its pharmacological properties and therapeutic efficacy in epilepsy. Drugs 1977;13:81-123. Gibbons RJ. Histone modifying and chromatin remodelling enzymes in cancer and dysplastic syndromes. Hum Mol Genet 2005;14:R85-92. Fog CK, Jensen KT, Lund AH. Chromatin-modifying proteins in cancer. APMIS 2007;115:1060-89. Grønbaek K, Hother C, Jones PA. Epigenetic changes in cancer. APMIS 2007;115:1039-59. Phiel CJ, Zhang F, Huang EY, Guenther MG, Lazar MA, Klein PS. Histone deacetylase is a direct target of valproic acid, a potent anticonvulsant, mood stabilizer, and teratogen. J Biol Chem 2001;276:36734-41. Rosenberg G. The mechanisms of action of valproate in neuropsychiatric disorders: Can we see the forest for the trees? Cell Mol Life Sci 2007;64:2090-103. Camphausen K, Cerna D, Scott T, Sproull M, Burgan WE, Cerra MA, et al. Enhancement of in vitro and in vivo tumor cell radiosensitivity by valproic acid. Int J Cancer 2005;114:380-6. Camphausen K, Tofilon PJ. Inhibition of histone deacetylation: A strategy for tumor radiosensitization. J Clin Oncol 2007;25:4051-6. Glozak MA, Seto E. Histone deacetylases and cancer. Oncogene 2007;26:5420-32. Yang XJ, Seto E. HATs and HDACs: From structure, function and regulation to novel strategies for therapy and prevention. Oncogene 2007;26:5310-8. Nackerdien Z, Michie J, Böhm L. Chromatin decondensed by acetylation shows an elevated radiation response. Radiat Res 1989;117:234-44. Carrier F. Chromatin modulation by histone deacetylase inhibitors: Impact on cellular sensitivity to ionizing radiation. Mol Cell Pharmacol 2013;5:51-9. Morales V, Giamarchi C, Chailleux C, Moro F, Marsaud V, Le Ricousse S, et al. Chromatin structure and dynamics: Functional implications. Biochimie 2001;83:1029-39. Martínez-López W, Porro V, Folle GA, Mendez-Acuña L, Savage JR, Obe G. Interchromosomal distribution of gamma ray-induced chromatid aberrations in Chinese hamster ovary (CHO) cells. Genet Mol Biol 2000;23:1071-6. Martínez-López W, Folle GA, Obe G, Jeppesen P. Chromosome regions enriched in hyperacetylated histone H4 are preferred sites for endonuclease-and radiation-induced breakpoints. Chromosome Res 2001;9:69-75. Martínez-López W, Folle GA, Cassina G, Méndez-Acuña L, Di-Tomaso MV, Obe G, et al. Distribution of breakpoints induced by etoposide and X-rays along the CHO X chromosome. Cytogenet Genome Res 2004;104:182-7. Martínez-López W, Di Tomaso MV, Méndez-Acuña L, Mühlmann M. Role of chromatin structure and activity in the induction of chromosomal aberrations. In: Obe G, Vijayalaxmi, editors. Chromosomal Alterations: Methods, Results and Importance in Human Health. Heidelberg, Germany: Springer; 2007. p. 209-22. Martínez-López W, Di Tomaso MV. Chromatin remodelling and chromosome damage distribution. Hum Exp Toxicol 2006;25:539-45. Falk M, Lukásová E, Kozubek S. Chromatin structure influences the sensitivity of DNA to gamma-radiation. Biochim Biophys Acta 2008;1783:2398-414. Murga M, Jaco I, Fan Y, Soria R, Martinez-Pastor B, Cuadrado M, et al. Global chromatin compaction limits the strength of the DNA damage response. J Cell Biol 2007;178:1101-8. Harada KH, Niisoe T, Imanaka M, Takahashi T, Amako K, Fujii Y, et al. Radiation dose rates now and in the future for residents neighboring restricted areas of the Fukushima Daiichi Nuclear Power Plant. Proc Natl Acad Sci U S A 2014;111:E914-23. Munshi A, Tanaka T, Hobbs ML, Tucker SL, Richon VM, Meyn RE. Vorinostat, a histone deacetylase inhibitor, enhances the response of human tumor cells to ionizing radiation through prolongation of gamma-H2AX foci. Mol Cancer Ther 2006;5:1967-74. Perry P, Wolff S. New Giemsa method for the differential staining of sister chromatids. Nature 1974;251:156-8. Pinkel D, Gray JW, Trask B, van den Engh G, Fuscoe J, van Dekken H. Cytogenetic analysis by in situ hybridization with fluorescently labeled nucleic acid probes. Cold Spring Harb Symp Quant Biol 1986;51(Pt 1):151-7. Pinkel D, Straume T, Gray JW. Cytogenetic analysis using quantitative, high-sensitivity, fluorescence hybridization. Proc Natl Acad Sci U S A 1986;83:2934-8. Pouzoulet F, Roch-Lefèvre S, Giraudet AL, Vaurijoux A, Voisin P, Buard V, et al. Monitoring translocations by M-FISH and three-color FISH painting techniques: A study of two radiotherapy patients. J Radiat Res 2007;48:425-34. Lucas JN, Poggensee M, Straume T. Translocations between two specific human chromosomes detected by three-color “chromosome painting”. Cytogenet Cell Genet 1993;62:11-2. Morton NE. Parameters of the human genome. Proc Natl Acad Sci U S A 1991;88:7474-6. Marchion DC, Bicaku E, Daud AI, Sullivan DM, Munster PN. Valproic acid alters chromatin structure by regulation of chromatin modulation proteins. Cancer Res 2005;65:3815-22. Coyle TE, Bair AK, Stein C, Vajpayee N, Mehdi S, Wright J. Acute leukemia associated with valproic acid treatment: A novel mechanism for leukemogenesis? Am J Hematol 2005;78:256-60. Chinnaiyan P, Cerna D, Burgan WE, Beam K, Williams ES, Camphausen K, et al. Postradiation sensitization of the histone deacetylase inhibitor valproic acid. Clin Cancer Res 2008;14:5410-5. Purrucker JC, Fricke A, Ong MF, Rübe C, Rübe CE, Mahlknecht U. HDAC inhibition radiosensitizes human normal tissue cells and reduces DNA Double-Strand Break repair capacity. Oncol Rep 2010;23:263-9. Purrucker JC, Mahlknecht U. Targeting the epigenome: Effects of epigenetic treatment strategies on genomic stability in healthy human cells. Clin Epigenetics 2010;1:45-54. Groselj B, Sharma NL, Hamdy FC, Kerr M, Kiltie AE. Histone deacetylase inhibitors as radiosensitisers: Effects on DNA damage signalling and repair. Br J Cancer 2013;108:748-54. Munshi A, Kurland JF, Nishikawa T, Tanaka T, Hobbs ML, Tucker SL, et al. Histone deacetylase inhibitors radiosensitize human melanoma cells by suppressing DNA repair activity. Clin Cancer Res 2005;11:4912-22. Kim YB, Ki SW, Yoshida M, Horinouchi S. Mechanism of cell cycle arrest caused by histone deacetylase inhibitors in human carcinoma cells. J Antibiot (Tokyo 2000;53:1191-200. Pettazzoni P, Pizzimenti S, Toaldo C, Sotomayor P, Tagliavacca L, Liu S, et al. Induction of cell cycle arrest and DNA damage by the HDAC inhibitor panobinostat (LBH589) and the lipid peroxidation end product 4-hydroxynonenal in prostate cancer cells. Free Radic Biol Med 2011;50:313-22. Thiel CS, Paulsen K, Bradacs G, Lust K, Tauber S, Dumrese C, et al. Rapid alterations of cell cycle control proteins in human T lymphocytes in microgravity. Cell Commun Signal 2012;10:1. Sourlingas TG, Kypreou KP, Topakas GN, Karchilaki IN, Stavropoulos-Giokas C, Sekeri-Pataryas KE. Effect of the histone deacetylase inhibitor trichostatin a in human peripheral blood lymphocytes as a function of donor age. Ann N Y Acad Sci 2007;1119:64-71. Hu LJ, Lu XF, Lu BQ, Huang YQ. The effect of valproic acid on SCE and chromosome aberrations in epileptic children. Mutat Res 1990;243:63-6. Schaumann BA, Winge VB, Garry VF. Sister chromatid exchanges in adult epilepsy patients on valproate monotherapy. Epilepsy Res 1989;3:182-4. Shan Z, Feng-Nian R, Jie G, Ting Z. Effects of valproic acid on proliferation, apoptosis, angiogenesis and metastasis of ovarian cancer in vitro and in vivo. Asian Pac J Cancer Prev 2012;13:3977-82.